Disneyland may be the happiest place on Earth, but sometimes you need a little nudge to get us into the magic. That&apos;s where we come in. We&apos;ve done our research (with a little help from our friends at the Visit Anaheim tourism board), and we spent time getting ripped at every nook and cranny of the Disneyland resort, and asked bartenders and Disney experts for their tips, which we will now impart to you. Since the members-only Club 33 is the only spot that serves booze at Disneyland—and is pretty closed off to the rest of us commoners—this guide focuses on our favorite liquored-up offerings at California Adventure and Downtown Disney. Cove Bar has the best seat in the house at California Adventure. You get to dine al fresco near Ariel&apos;s Grotto over a body of water and with a view of the roller coaster and Ferris wheel. Don&apos;t expect any craft cocktails here, but you can surely get wasted on their strong Manhattans and Mai Tais. Do yourself a favor and order off their secret menu, where you can get one of their most Instagrammable drinks: the Funwheel. It&apos;s a version of the Long Island that comes out as a layered cocktail in stripes of yellow, pink and blue, and is topped with a key-lime foam. 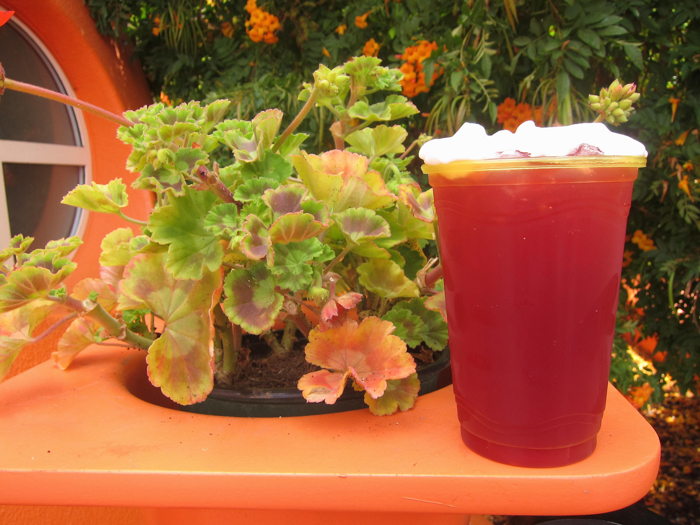 However, flavor-wise, we&apos;d go for their sweet Melrose Place drink that is also a riff off the Long Island (the tried-and-true college drink of choice), but is accompanied by the classier additions of strawberry puree and champagne. If you feel enticed to get a boozy version of their Cotton Candy Lemonade—that is actually topped with the fluffy floss—just know it&apos;s mostly good for an Instagram brag. 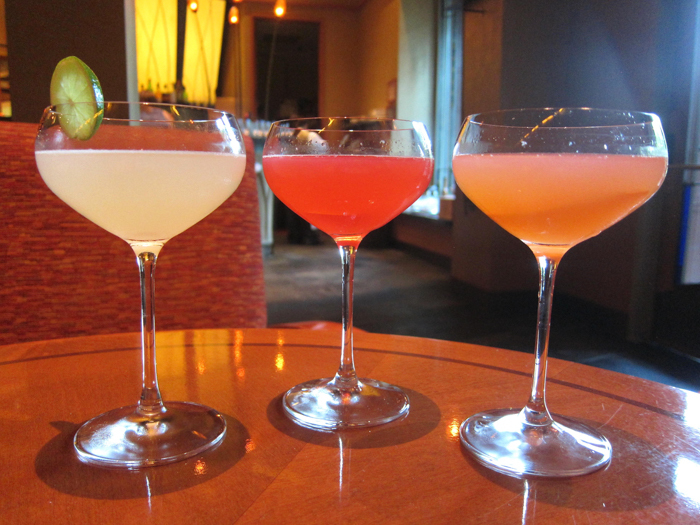 A server told us that it isn&apos;t worth the money: It has less alcohol than the other drinks and costs more. Cocktails run around $10 here, but you can also get wine and beer, as well as tequila flights. 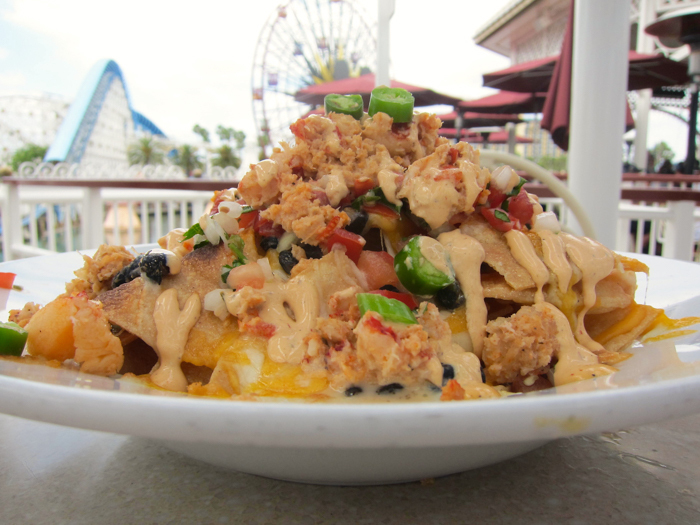 While you&apos;re here, you might as well get an order of the Lobster Nachos, one of the best things to eat at California Adventure. The dish has actual chunks of lobster in it and comes out in a hefty, sharable portion. Cove Bar is a popular spot, and you might have to wait a bit for a table. But if you&apos;re not in any rush, this is the place to be. 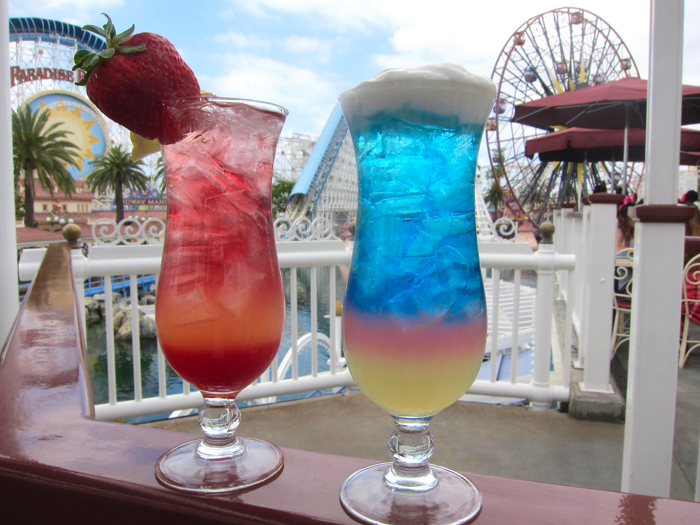 Cove Bar is located at Paradise Pier at California Adventure, and is open from 11 a.m.-7:30 p.m. daily. Cozy Cone Motel is located at Cars Land at California Adventure, and is open from 8 a.m. to 9 p.m.
Carthay Circle Lounge is one of our favorite hideaways at the Disney parks. The dimly lit and chill bar is located on Buena Vista Street, on the ground floor of a building that has a facade of an old-timey movie theater. (The lounge pays homage to the original Carthay Circle Theatre, which screened many of Walt Disney&apos;s films, including his first animated feature, Snow White and the Seven Dwarfs.) With its hanging chandeliers, white marble bar counter and framed black-and-white photos of Disney, the swanky lounge channels the golden age of Hollywood, and you&apos;ll feel like you&apos;re on the set of a noir film. The handcrafted cocktails—which seriously pack a punch—also are nostalgic for the past. You won&apos;t find run-of-the-mill Long Island-type drinks here like you would at Disney&apos;s other bars. The bartenders here craft cocktails like the very strong Carthay Manhattan that&apos;s garnished with Luxardo maraschino cherries; and the refreshing Tequila Daisy—a creamy concoction of lime, Cointreau, and violet liqueur, and adorned with a candied flower. It&apos;s the little touches that count, too, like how their bartenders will dunk ice cubes shaped like large spheres or dodecahedrons into the beautiful cocktails. If you get hungry, they also have some fun, global-inspired bites like queso fundido and Vietnamese tacos. The food menu isn&apos;t as large as Carthay Restaurant&apos;s upstairs, but the dishes will get the job done in soaking up the liquor. Since your libations are being hand made, remember to be patient because it&apos;s worth the wait. And at this low-key lounge, it&apos;s usually easy to find a seat. The drinks cost about the same as you&apos;d expect from an upscale L.A. bar (around $12-$15) and you can also get craft beers and wines if you&apos;re trying to pace yourself. Carthay Circle Lounge is located on Buena Vista Street in California Adventure, and is open daily from 11:30 a.m.-8 p.m. This little stand inside Paradise Pier is our go-to for a quick brewsky and Mickey-shaped (!) pretzels. It carries some of better beers at California Adventure, though that doesn&apos;t mean you&apos;ll be getting craft brews like a Monkish or Three Weavers. Think more along the lines of Karl Strauss, Blue Moon and Pacifico. They usually have about six beers on tap and a small variety of wine and Prosecco, all ranging from $7-$11. If you&apos;re lucky, you might be able to get a taste of Karl Strauss&apos; seasonal, banana-tinged hefeweizen. But what we love most about Bayside Brews is the location. It&apos;s close by to the Silly Symphony Swings and Golden Zephyr, so you can get your carnival rides on while you&apos;re a little buzzed. There&apos;s shaded seating by the swings, too, a perfect place to cool down from the heat and snap some choice photos to send in to the DILFs of Disneyland Instagram. Also, right across the way is the open-air Paradise Garden Grill, where a delightful band will sometimes perform live while you sip on your beer. 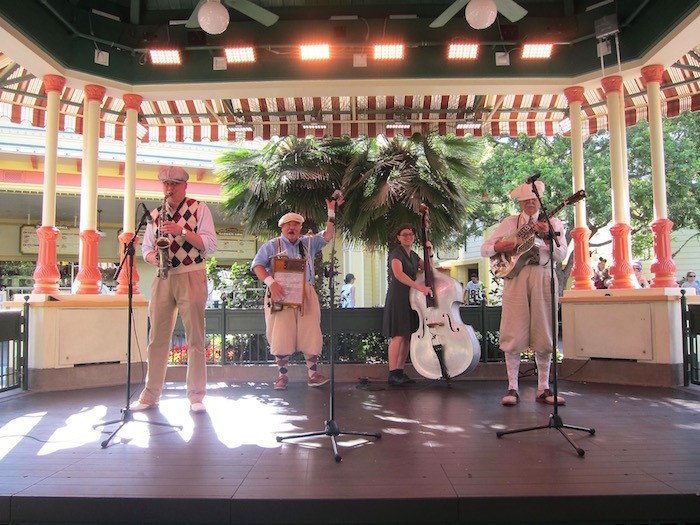 Last time we were there, an upbeat bluegrass band performed—and yes, a washboard was involved. 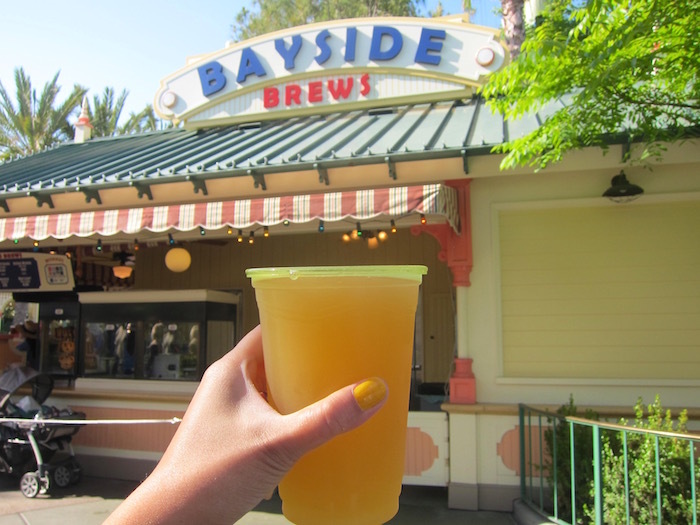 Bayside Brews is located at Paradise Pier at California Adventure, and is open daily from 12 p.m.-8 p.m.
Alfresco Tasting Terrace is located at the Pacific Wharf at California Adventure, and is open daily from 2 p.m. to 8 p.m. 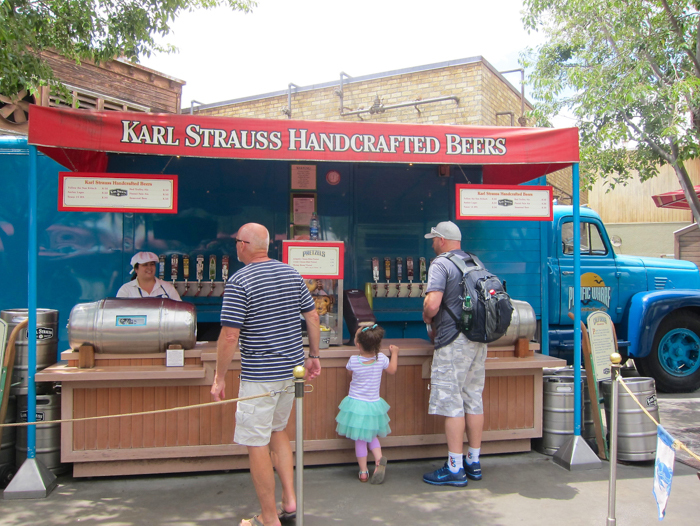 The Karl Strauss Beer Truck is located in Pacific Wharf at California Adventure. Sonoma Terrace is located in Pacific Wharf in California Adventure, and is open from 11:30 a.m. to 8 p.m. 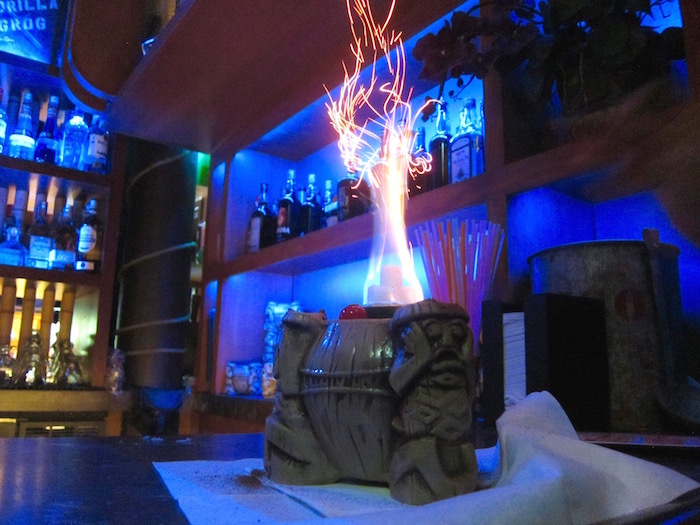 Trader Sam&apos;s is located at Disneyland Hotel at 1150 Magic Way in Downtown Disney, Anaheim, (714) 778-6600. It&apos;s open from 11:30 a.m. to 1:30 a.m. daily. 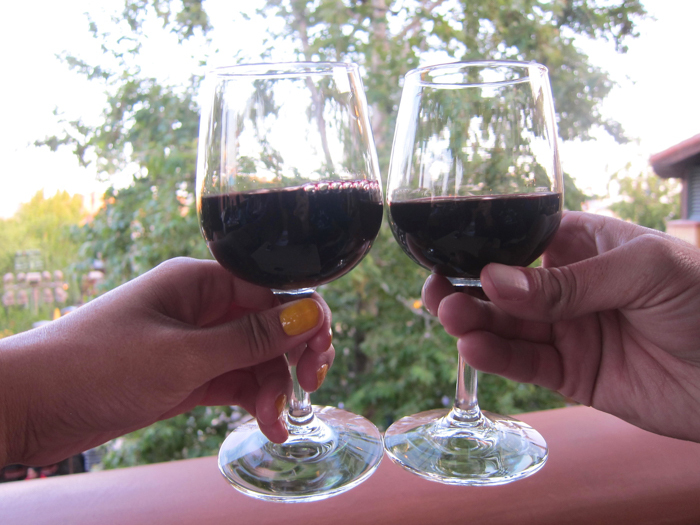 Tucked away in Disney&apos;s Grand Californian Hotel is Napa Rose, one of the fancier restaurants in the area. But if you just want a taste of the ambiance (think Art Deco design and a lively atmosphere) without paying for the total commitment, head over to the restaurant&apos;s lounge. This classy spot is good for groups, with plenty of tables and comfy armchairs. There&apos;s even a fire pit out back where you can do some outdoor drinking with some buddies. You can get craft cocktails with high quality spirits and bitters, like old fashioneds and Moscow Mules. 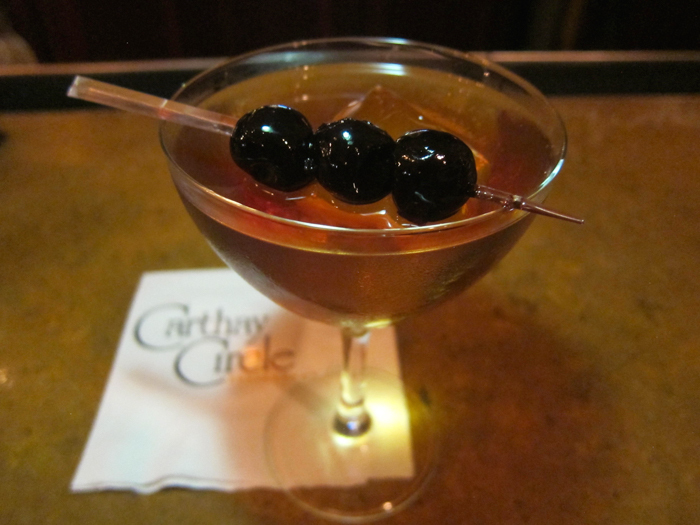 The drinks aren&apos;t as tasty as the ones at Carthay Circle, but they can certainly get you drunk and are still better than some of the other libations around the area. Drinks will run you around $10-$14. Appetizers are a little pricier here than your average Disney spot, but what you&apos;re getting is more gourmet, too, like pan-roasted diver scallops and pheasant meatloaf. (Three words: Treat. Yo. Self.) One of our favorites is the decadent pizzetta, a sharable pie that&apos;s topped with prosciutto, caramelized onions and Cambozola cheese. Napa Rose Lounge is a good spot for some R&R, and maybe nobody will notice if you doze off for a quick hangover nap. Napa Rose Lounge is located inside Disney&apos;s Grand Californian Hotel at 1600 S Disneyland Dr. in Downtown Disney, Anaheim, (714) 300-7170. It&apos;s open from 5 p.m. to 10 p.m. daily, but stays open later on Fridays and Saturdays to 11 p.m.
Uva Bar is the only bar on our list that isn&apos;t Disney-themed, but it&apos;s a solid choice. It&apos;s situated smack dab in the middle of Downtown Disney, and is a great stop while you&apos;re on your bar crawl between the parks. (It&apos;s also my favorite place to start drinking since they open at 8 a.m.) Uva&apos;s restaurant is indoors, but the place to be is at the outdoors bar, where you can catch some rays while sipping on drinks. It&apos;s owned by the Patina Group—the folks behind hot spots like Nick & Stef&apos;s Steakhouse and Ray&apos;s and Stark Bar—so you know it&apos;s not dingy. It never feels overly packed here and it&apos;s usually pretty easy getting a table. The staff is friendly and efficient, making for a quick in-and-out. They have a large beverage menu, with everything including craft beer like Ninkasi and Ballast Point, sangria with chunks of fruit, shooters (because why not? ), and refreshing margaritas and drinks made with watermelon and guava. 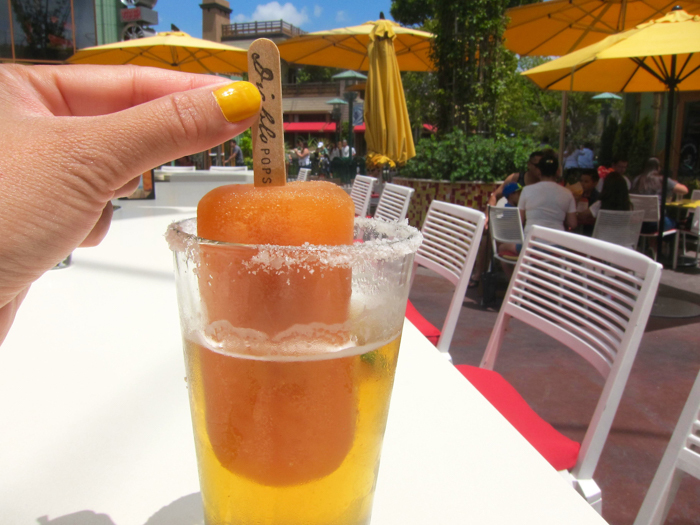 A fun beverage to get is their Perfect Michelada, which is a beer of your choice (we suggest the Modelo) and a tomato lime Diablo Popsicle that you dip in the glass. Drinks range from $8-$13, and it&apos;s the kind of place where you can get bar food like crispy calamari and street fries topped with chorizo and cheese curds—a bar after our own heart. Uva Bar is located at 1580 Disneyland Dr. in Downtown Disney, Anaheim, (714) 774-4442. It is open from 8 a.m.-11 p.m. daily, and stays open on Fridays and Saturdays to midnight.